Directed by a woman (a rarity for Sri Lankan cinema) and dealing with the 20-year long war between the Singhalese and Tamil ethnic groups in the country in an allegoric and symbolic way, “House of my Fathers” is one of the most interesting productions of 2018. 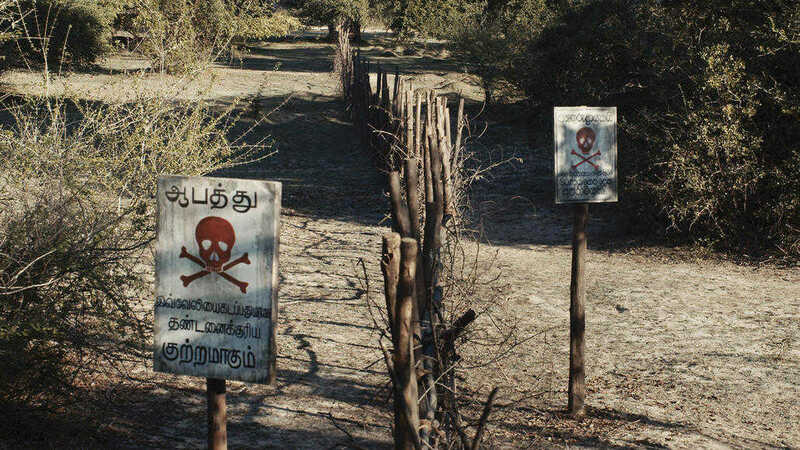 Barbed wire and keep-out signs separate two Sri Lankan villages, one Tamil and one Singhalese, that have been at war with one another forever. When both communities become completely sterile and there is fear for the continuity of their bloodlines, the village elders decide to make a sacrifice, after shamans from both villages suggest that in order to lift the curse, a Sinhala man and a Tamil woman must journey together into a forest in a nearby island. However, they also predict that only one of them will return. Accordingly, Asoka, a once-respected soldier who has become a pariah after his failed attempt to wrest control of his village, and Ahalya, a woman who has become mute due to the trauma of losing her husband and son in the war, travel to the specified place. The duo is accompanied by a neutral stranger named Strange Doctor, a rather enigmatic persona. The three of them travel to the forest, where a series of surreal occurrences have them experience the blights of war, and eventually bring the two former enemies closer together. Suba Sivakumaran directs a film that unfolds much like a road movie, through a surrealistic trip to the awful consequences of war. As we watch and hear bombs and guns interrupting a dance and children playing, while creating uncountable refugees, we also take a look at the characters’ troubled minds, through their past stories, which again feature the consequences of war and violence in general. Sivakumatari seems to suggest the violence is a problem wherever it comes from, either from political or simple reasons of origin. The fact that the two “enemies” eventually end up together, and that Ahalya overcomes her trauma and regains her voice, gives a narrow space of hope in the overall pessimistic nature of the film, but even that does not last for long, and the hate that dominates the relationships of the people in the story eventually takes over once more. In that regard, the director conveys a rather pessimistic message, as she seems to state that no ray of hope is shining in the relationship of the two Sri Lankan opposing factions any time soon. The style of the odyssey to the uncanny that permeates the film benefits the most by Kalinga Deshapriya’s cinematography, which manages to commute the sense of disorientation the protagonists feel quite elaborately in the scenes in the forest, in surrealist fashion. At the same time, the presentation of the circumstances of the two villages is dominated by realism, with the images having the same quality there also, with the help of the excellent production design by Bimal Dushmantha. Nse Asuquo’s editing infuses the film with a relatively slow pace, that suits its aesthetics to perfection, as the succession of the scenes also communicate the disorientation the characters feel. Bimal Jayakodi as Asoka and Pradeepa as Ahalya are quite good in their parts, performing their roles in dramatic but also quite realistic fashion. The reluctant way they warm up to each other and the presentation of their inner struggle due to events of the past are the highlights of their performances. “House of my Fathers” is a more than hopeful debut, from a director who seems to have much to say.